(L – R) Acting City Government Assistant Department Head III Maribel Cayco; Social Service Development Department Head Fe Macale; Quezon City Administrator Aldrin Cuna; ABS-CBN Lingkod Kapamilya Foundation, Inc. (ALKFI) Chairman Eugenio Lopez III; Quezon City Mayor Herbert Bautista; ALKFI Managing Director Susan Afan; Bantay Bata 163 Program Director Jing Castaneda – Velasco and ALKFI Chief Finance and Services Officer Lita Lara seal partnership to re – launch Bantay Bata 163 Children’s Village and to upgrade the Hotline 163. "Hindi ko po lubos maisip noon kung bakit po ako ... kami ... tinutulungan ng Bantay Bata gayung hindi naman po namin kayo kaanu-ano. Ang Children’s Village po ang naka-heal sa akin. Dito ko po na-experience ang nawala sa akin noong bata pa ako. Mas nakilala ko din po ang sarili ko. At dito po, tinulungan akong mangarap at maging matapang sa hamon ng buhay. Kahit paglabas po namin sa Children’s Village, nandoon pa din ang suporta,”. "Rose", one of the beneficiaries of Bantay Bata 163, shared how her life was transformed in the Children’s Village after she was rescued in 2006. Her narration touched the hearts of everyone who attended the simple program that sealed the partnership between Bantay Bata 163 and the Quezon City government. Rose was in tears as she remembered the sense of hope that she felt when she was rescued by Bantay Bata 163 in 2006, along with her two siblings. They were sheltered in the Children’s Village for protective custody for 2 years. After she was discharged from the Village, Rose was continuously supported by Bantay Bata 163 as one of the scholars of the Bantay Edukasyon Program. After 7 years of thriving in her career, Rose is now a licensed and practicing teacher in Bulacan. She said that this is her way of paying it forward ... by giving hope and inspiration to other children through teaching. The Children's Village is at the heart of Bantay Bata 163's programs and services. It is a home where abused kids will be safe and will experience holistic therapy and healing. This collaboration between the Quezon City government and ABS-CBN Lingkod Kapamilya’s Bantay Bata 163 made the re-launch of the Children’s Village possible. The LGU of Quezon City and Bantay Bata 163 share the same mission to champion Filipino children's rights: Child protection rights, survival, development, and participation rights, especially for children who are unwanted, uncared, and unloved. Quezon City Mayor Herbert Bautista commits to uphold children’s rights and to push for projects for the welfare of children. “When we assumed responsibility in 2010, the City Administrator and I agreed to come up with the programs that are human rights – based. That is our goal. There are about 600,000 children only in public elementary and high school in our city. So we have been trying to partner ourselves with a lot of entities. Even at the time when we were just starting, we already partnered with ABS-CBN Foundation. We hope that this initiative will encourage other LGUs in other parts of the country to also engage in similar undertakings for the children,” Mayor Bautista shared. Records from the Quezon City Public Information Office show, nearly 20% of the city’s total population are made up of children younger than 10 years old, while 30% are younger than 15 years old. Because of the LGU’s many projects on children’s welfare, Quezon City was named a Child-Friendly City by the DSWD's Council for the Welfare of Children or CWC. QC has partnered with Bantay Bata 163 by extending a 20 Million fund assistance to the NGO for a 12-month cost of care to 100 children whom they will refer to the Children’s Village for residential care services and comprehensive case management. This is part of the local government’s response to address the situation of their children, particularly those abused, neglected, and exploited, and the children at risk from the streets who need care and protection in a more therapeutic environment. As a counterpart of Bantay Bata 163, it will manage the operations of the Children’s Village, which shall provide a 24/7 group care to these children, under the guidance of a trained staff and within a structured therapeutic family-like environment. The overall objective for the children in the Village is to eventually reintegrate them to their family who has been provided intervention by the QC government to take back custody of their children. The children can also be placed in better alternative child care arrangements for their best interest and welfare. 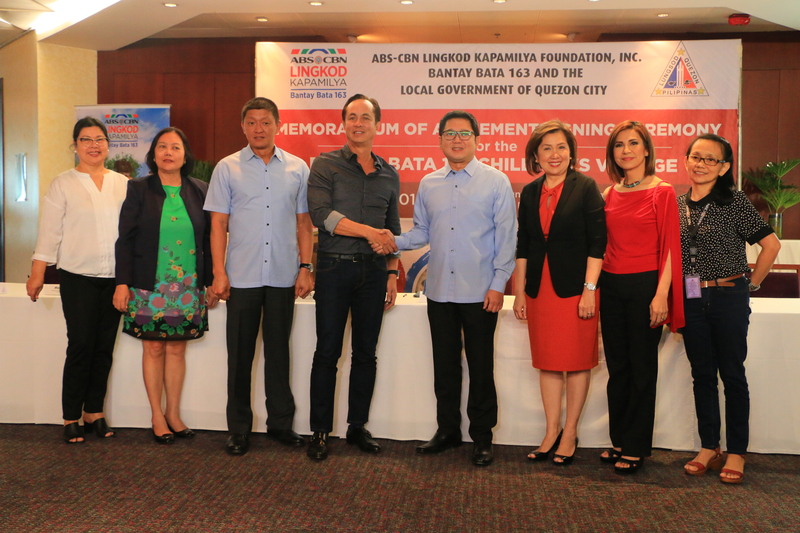 ABS-CBN Lingkod Kapamilya Chairman Eugenio Lopez III expressed his gratitude for the relentless support of Quezon City Government. “[We] thank the Quezon City government for allowing Bantay Bata 163 to continue its mission of serving children by providing them a place of refuge. As we seal our partnership, we hope to inspire other public and private initiatives so that more Children's Villages can rise all over the country and create pockets of hope where children can feel safe, loved and have a brighter future,” Lopez expressed. The re-launch of the Children's Village was very timely as it also coincided with the upgraded operations of Bantay Bata's Hotline 1-6-3, the first helpline service for children in crisis. The Hotline 163 provides the facility where the public can call to report cases of child abuse either directly or indirectly witnessed by the caller. Well-trained social workers facilitate quick response on reported cases, coordinate and refer cases for immediate intervention and rescue when needed, as well as provide information and guidance to callers. “The Hotline 1-6-3 and the Children’s Village are the very foundation of Bantay Bata’s existence. We respond, rescue and rehabilitate. But more than that, Bantay Bata 163 is now taking a more proactive role through our Bantay Pamilya program -- going into preventive and informative advocacy campaigns to promote family values, positive parenting and the empowerment of each Filipino child through workshops and family summits. With more challenges to face, more hands are needed to protect the Filipino children, the fathers and mothers of tomorrow,” Bantay Bata 163 Program Director Jing Castaneda – Velasco articulated. The upgrade of Hotline 163 and re-launch of the Children’s Village is a response to the alarming cases of child abuse in the country. Based on the 2016 National Baseline Study on Violence Against Children commissioned by United Nations Children’s Fund (UNICEF) and several non-government organizations, 8 out of 10 children suffer from a form of abuse, 1 in 3 children experiences physical violence that are usually happening at home while 3 in 5 children suffer from psychological violence and nearly half of the children experience violence online from a foreigner’s standpoint. Bantay Bata 163 invites everyone to join in the advocacy to push for children’s protection and welfare to ensure a better present and future generation.